Conveniently located to serve the areas of Maryland, Virginia and Washington, D.C.
Is your skin looser than it used to be? Do you wish you had a quick, non-invasive way to erase your wrinkles? InMode Forma is a safe, effective way to tighten and plump your skin, without the use of needles or incisions. InMode Forma achieves effective, youth-restoring rejuvenation by exposing the skin to controlled radio frequency waves. The heat of the waves promotes skin tightening and collagen regeneration within the skin, which restores youthful volume to the area. You will see smoother skin where you once had fine lines and wrinkles. The InMode Forma system applies heat safely: it protects your skin by reading skin temperature in real time 1,000 times per second in order guarantee the skin reaches the temperature required for skin rejuvenation and not one degree higher. Forma is a thermal skin treatment that is capable of restoring your skin to a more healthy, youthful appearance. To learn more about what Forma can do to treat your wrinkles and skin laxity, call Dr. Michaels’ and schedule your consultation. 1 What is InMode Forma? 3 What Are the Benefits of Forma? 4 How Many Treatments Will I Need? 5.1 Can I Combine Fractora & Forma? 6 Am I a Candidate for Forma? 9 When Will I See Results? 11 What Does Forma Cost? InMode Forma applies focused radio frequency waves to your skin in order to address skin laxity and smooth wrinkles. The treatment is gentle and designed to treat even the most sensitive skin. The radio frequency waves will heat and tighten the skin, as well as penetrate to the level of the skin responsible for collagen production. 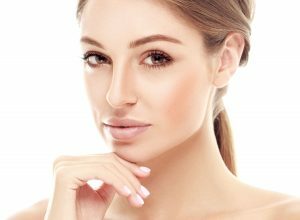 Collagen is a vital component of soft, firm skin: however, our bodies slowly produce less collagen as we age, resulting in the weakening of the skin’s support structures. Our reduced collagen results in looser skin and the formation of wrinkles. The Forma system tightens the skin and stimulates new collagen production in the dermis. This new collagen, over time, produces a smoother, more youthful appearance in the skin. Forma’s gentle but targeted radio frequency technology also enables Dr. Michaels to do mild contouring in the treated area. He will make sure your appearance is balanced and youthful-looking. The Forma system contains an algorithm which tracks the temperature of the skin by the millisecond. This keeps the tissue safe and makes sure the skin is exposed to the exact temperature necessary for tightening and collagen stimulation. Patients who would like to tighten and plump the skin in larger areas of their body may receive their treatment with Forma Plus, a component of the Forma system capable of treating larger areas. What Are the Benefits of Forma? Create almost immediate skin contraction. No need to wait through weeks of recovery to see results. You will leave Dr. Michaels’ office with less apparent, smoothed fine lines and wrinkles. Contour a patient’s face or body to achieve a slimmer, more youthful appearance. Stimulate collagen generation, which will improve the volume and health of your skin for months to come. Give you peace of mind. Forma’s temperature sensor will keep your skin safe while providing effective skin rejuvenation. Provide a comfortable experience. Thanks to Forma’s application of RF waves, patients enjoy a pain-free treatment. Most patients will see their skin become tighter and their wrinkles diminish after a single Forma treatment. After two to three treatments, you will see an impressive improvement in your wrinkles and skin laxity. You will look and feel years younger! If you are tired of your acne scars and hyperpigmentation, Fractora could be the skin solution you are looking for. Fractora is another part of the InMode system which applies targeted radio frequency waves to the dermis. Like Forma, Fractora’s controlled heat will reach and stimulate collagen production in the skin, which creates a youthful volume within your skin in the months following your treatment. The microneedling, combined with the RF waves, will promote healthy resurfacing. Fractora differentiates itself from Forma with its application of a grouping of pins to the skin. The pins create microlesions, which promote the skin to heal itself. The pins come in configurations of 60, 24, or 24 coated, and vary by length to allow Dr. Michaels to penetrate to the depth of the dermis necessary to stimulate your collagen production. Fractora is an excellent means of erasing your acne scars and hyperpigmentation while improving the overall youthful appearance of your skin. While Fractora can improve your skin after one treatment, you will see your best results after three to four sessions. Fractora is capable of resurfacing and rejuvenating all skin types. Can I Combine Fractora & Forma? If you are interested in restoring healthy volume and elasticity to your skin, as well as improving the appearance of your scars and skin pigmentations, you may want to consider undergoing a combined treatment of Forma and Fractora. Forma will improve the volume and deep health of your skin, while the Fractora will smooth and clear the surface of the treated area. Patients will need to complete a short period of downtime after receiving both Forma and Fractora. The microneedling incorporated into Fractora will require a small recovery window, while the skin heals from any resulting redness or swelling. Am I a Candidate for Forma? You may be a good candidate for Forma if you want to improve the elasticity of your skin, to reduce the appearance of your fine lines and wrinkles, and to restore youthful volume to your skin. Forma will address the quality and deep health of your skin, but will not address scarring or hyperpigmentation. Forma may not be the right rejuvenation choice for patients with darker skin tones. If you are experiencing an active skin condition, endocrine disorder, or serious medical condition, you may not be a candidate for Forma at this time. To learn more about your candidacy for Forma, please call Dr. Michaels’ office today to schedule a private consultation. Dr. Michaels takes care to make sure every skin rejuvenating procedure his patients receive is the best choice for both their health and their personal goals for their appearance. During your consultation with Dr. Michaels, he will assess your medical history and medication use, as well as examine the area or areas you would like to improve with Forma. It is important to notify Dr. Michaels of any pre-existing conditions you may have at this time. Feel free to ask Dr. Michaels any questions you may have about Forma, Fractora, or any additional skin treatment. Dr. Michaels and his staff are proud to offer safe, cutting-edge care to each and every patient. If Dr. Michaels believes your case will be better treated by an alternative treatment, he will suggest what he believes your best option will be. If you are interested in rolling back the effects of time on your skin, call Dr. Michaels’ helpful team today to schedule your private consultation. You will see your best results with Forma after completing two to three treatment sessions, spaced six to eight weeks apart. Your Forma treatment will be completed in 45 minutes to an hour, per treatment area. During your Forma session, software-monitored radio frequency waves will target the depth of your skin responsible for collagen production. You may feel a warming sensation, but no pain is involved. The skin will feel tighter following your treatment. Your skin will be tighter immediately following your Forma treatment, which will help to smooth your fine lines and reduce the appearance of your wrinkles. You will notice a major improvement in your skin within two weeks. Due to the rejuvenated collagen within your skin, your treated area will continue to look more plump and youthful over the next three months. Forma requires almost no recovery of any kind. You will be able to return to your regular activities the following day, or even the same day as your procedure if you choose. It is recommended that you avoid direct sun exposure and wear broad-spectrum sunscreen. You also will want to stay away from using hot water or rough manipulation of the skin in your treated area for a few days following your Forma treatment. The price of your Forma treatment will depend on the area or areas which you would like to rejuvenate, as well as the number of Forma sessions you plan to undergo. After Dr. Michaels assesses the needs of your skin, he will create the treatment plan that’s right for you. Based on this individualized proposal, his staff will provide you with a breakdown of the cost of your anticipated Forma treatment. If you are tired of the loose skin, fine lines, and wrinkles on your face, neck, or body, Forma can be the quick, non-invasive solution you’ve been looking for. To learn more about how you can turn back the effects of time on your skin, call to schedule your initial consultation with Dr. Michaels. Dr. Joseph Michaels is committed to helping you acheive the results that you want. Contact us today to set up a consultation with the doctor and be closer to the results that you want.